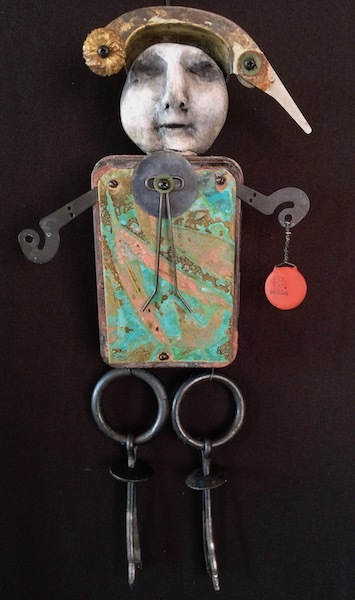 I call my tin figurative assemblages "Eeeps" and I have been making these for the past 15 years. Each year they seem to grow, change and morph into something different and this year is no exception! In this inspiring workshop we will be using an empty tin for our base, as we do in my "Faux Etching" workshop, only this time we are using completely different materials and techniques. In the morning we will begin by using a two part clay to create one of a kind faces for our Eeeps. I will demonstrate a quick & easy way to make a mold of just about anything and I will have my hand made molds available for you to use. From there we will move on to leaf printing. Leaf printing on metal was a happy accident that I discovered after using metal instead of tiles to hold eco dyed paper. I spent months perfecting this technique and I finally have it down to where I can teach it without using pots of boiling water, since hotels tend to frown on this! We will attach our favorite leaf print to the cover of our Eeep, and you will have extra to take home for other projects. The rest of the afternoon will be spent constructing unique figurative sculptures using the metal that we altered, our new faces and found objects. While working on the sculpture, we will cover basic cold connection methods as well as composition & design. In the evening we will work on the inside of our sculptures, creating a small book or whatever else you can imagine inside the belly of your Eeep. 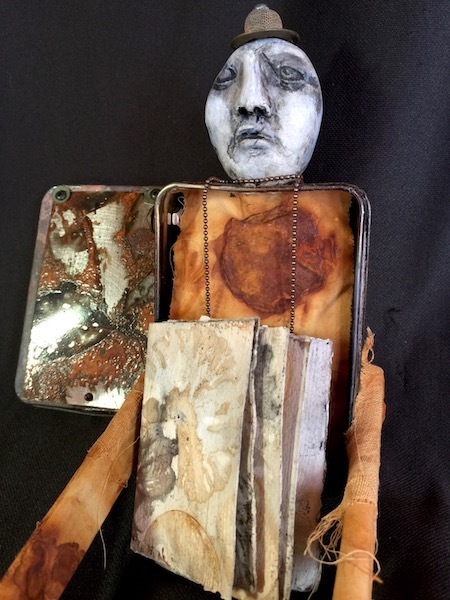 You will leave with 2 figurative sculptures and extra materials to create a third at home. Your final Eeeps will be approximately 12" x 6" after adding found objects. The tin itself measures 4" x 1 1/2". Please read the supply list NOW and collect your supplies early. You may have to order some things online, so please allow plenty of time for this. I do not sell extra supplies in class. You may not be able to complete the project in class if you do not bring what is listed on the supply list. If you have trouble finding anything, or if you have any questions, please contact me at least two week prior to class at leighannalight@gmail.com. AVES APOXIE CLAY or MAGIC SCULPT, 8 oz. METAL, BRASS OR COPPER 2 pieces, 4 x 6 or larger of brass, copper & tin, thin enough to cut with tin snips, which I will have in class. Metal absolutely must these specific metals or the process will not work, no aluminum please. Thin brass or sheet metal is available at ACE Hardware... BRASS Click here! COPPER Click here! K&S measures metal by thickness not gauge and it is listed in the product description before the size. A good thickness is .010. The thickness isn't super important, you'll need to be able to cut it with scissors. PVA GLUE, available...Here! ACRYLIC PAINT, 1-3 small bottles or tubes, we will be using this to paint the pages of our book. You can't go wrong with blue, brown and green as it will match the colors in your leaf printed metal. 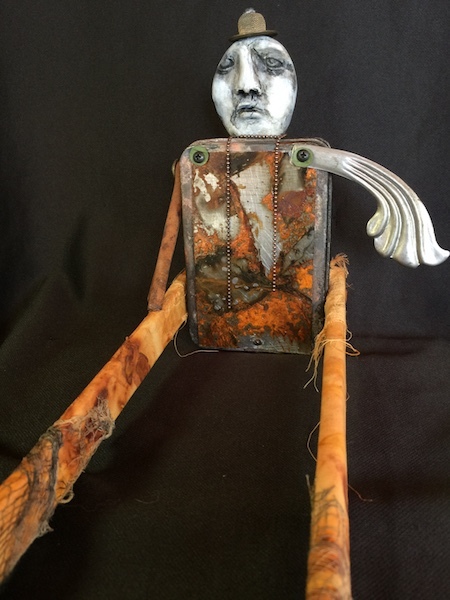 FOUND OBJECTS, A variety of objects that can be added to your sculpture... Think of small objects that can be used as legs, arms, hair and hats. Please see class pictures for ideas. I will have several of these for the class to share. If you'd rather not wait, please bring your own. A METAL PUNCH- used for punching holes in metal. If you have one, please bring it. If not, don't go out & buy one, I will have 2 or 3 to share. Your favorite ECO DYED PAPER or other paper that you love! We will be using this to add to your small book. Please bring a few extra small pieces to share.